QUESTION: There is a directional change the week of 2/23 followed by a turning point the week of 3/2. Does that mean that the actual high close may come the week of 2/23 but the inter week high may come the week of 3/2? Thanks in advance for your answer. ANSWER: The Directional Change can be by itself a very fascinating tool. The directional change can at times be the beginning of a breakout to a new trading level as was the case for the week of 11/02/2014 in the Dow. This was confirming that the Dow would take off to a new plateau in price movement. 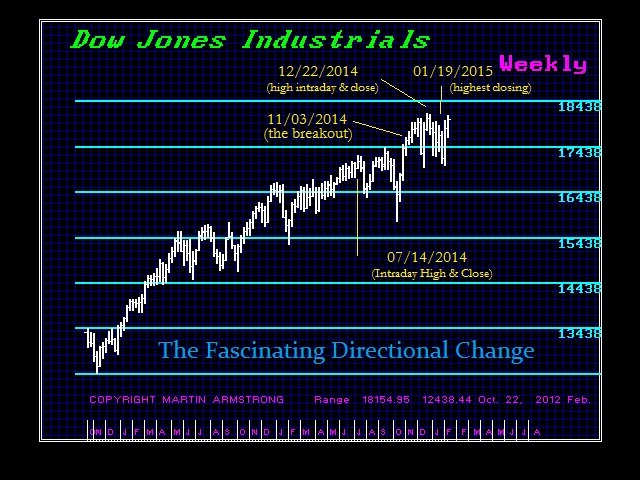 Yet at other times, Directional Changes can mark the high or low and the culmination of a trend as was the case for the weeks of 07/14/2014 and 12/22/2014. 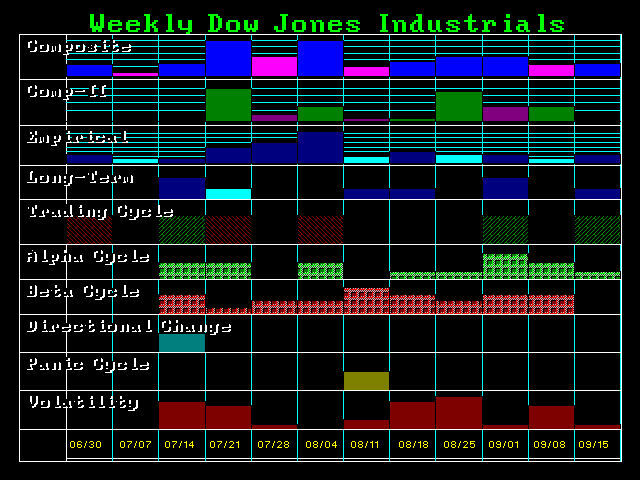 The Directional Change for the week of 07/14 was followed by a major turning point 2 weeks later both on the top composite and the long-term, which produced the spike low. We see the same type of pattern where the Directional Change of 12/22 was preceded by the major turning point for 12/08 which was also the key spike low. 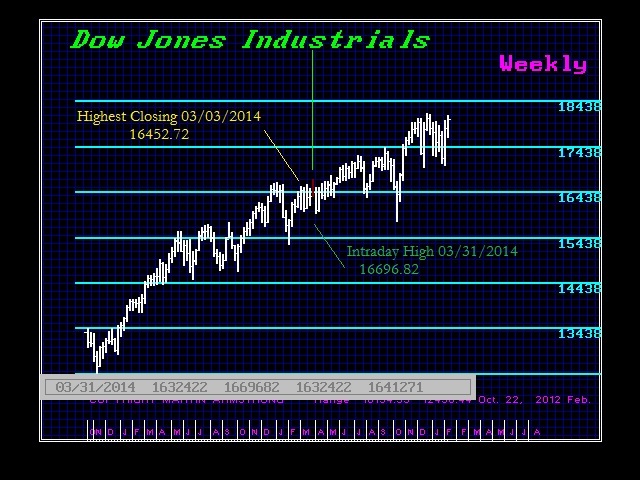 The week of 01/19/2015 produced the highest closing for that reaction with the intraday high the week before. Then the Dow fell into the intraday low two weeks later. The turning points are based generally on the intraday event. We will be adding the turning points on a closing basis to help break out all three dimensions to this complex movement. As illustrated here, sometimes the highest closing and the intraday can be as much as 4 units of time apart in separation. So that applies on a fractal basis from daily to yearly level. The interesting demonstration here is that (1) this is not my personal opinion, and (2) it illustrates that there is a hidden order within what appears to be chaos. 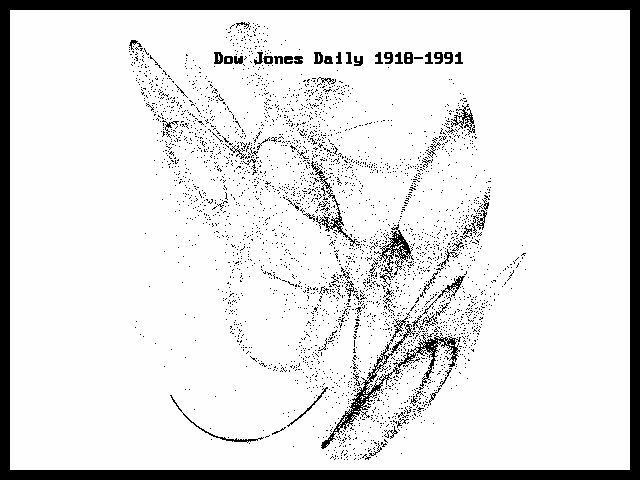 Here is the output of our Chaos Modeling for the Dow Jones. This clearly illustrates that there are trading plateaus which exist where the market will trade and then breakout to a new plateau. 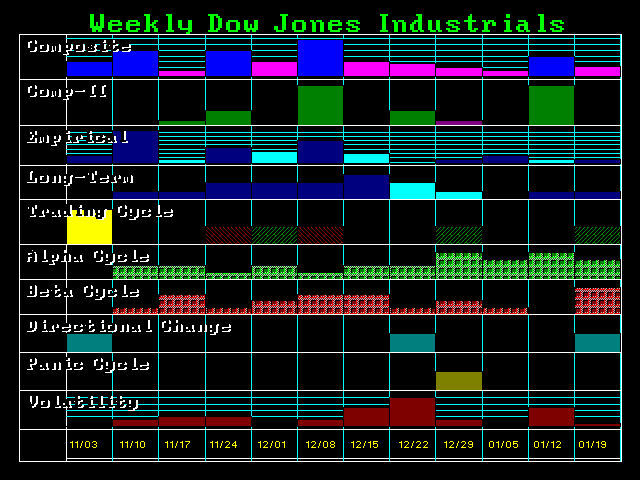 This is taking the daily data of the Dow Jones Industrials from 1918 up until 1991. The key here is this plot represents absolute PROOF that there is order behind the appearance of chaos. How can we even predict a turning point unless there is hidden order behind the false image of chaos. What is taught in university economic classes is dead wrong. We cannot manipulate anything be it markets, society, or politics. Not even absolute power delusions as the communists possessed, could prevent the hidden order from collapsing the best efforts of man who has the audacity to think he can alter the laws that government everything. This means something very profound. NO POLITICIAN can run for office promising to change anything for they cannot alter the trend of the entire world. We either learn to live within the system, or we go down in flames each and every time. This is why I totally disagree with the people who claim gold is manipulated. They are fools who cannot see that the system is functioning as a weather. Three warming summers does not mean man has altered the entire weather system into Global Warming. The sheer arrogance of assuming such powers is to assume we are God. Mankind is simply way too corrupt to ever run anything according to plan. When communism fell, leaders were living in luxury behind walled compounds. Human Nature is nature. It cannot be altered. The same as in a relationship. If you try to change the person, it will end. You either accept that person for what they are or forget get. Society is the very same way. You cannot change Human Nature be it an individual or society. The absolute proof is in this very chart. 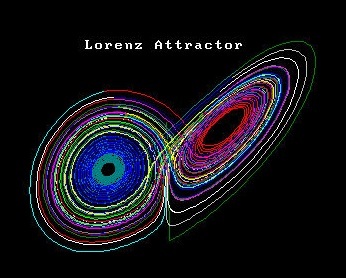 Order exists behind the appearance of Chaos that fools cannot see precisely in Lorenz’s plot of the weather system which also proves there is not Global Warming. This will be added to the user interface for Phase II of bringing Socrates online. BTW, we can still use programmers who can think out of the box, code in Visual Studio, and are flexible to move.